(BPT) - As a kid, it didn’t get much better than grilled cheese: the buttery toast, the molten cheese and the savory satisfaction from that first bite to the last. Fast-forward to adulthood. Somehow throwing together two pieces of white bread with a slice of processed cheese simply doesn’t have the same appeal. Fortunately, chefs around the country are reimagining the kid-approved favorite and gourmet grilled cheese sandwiches are popping up on the menus of restaurants everywhere. Their secret: Mix up the ingredients and cooking methods to reinvent this classic comfort food into a palate-pleasing meal for all ages. 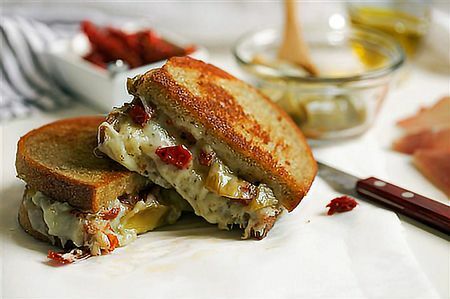 Here are our secrets for recreating a gourmet grilled cheese in your own kitchen. Havarti: Has a light buttery, creamy taste with a mellow aroma and is semi-soft, so it melts perfectly. Pair Havarti with fruit, jam or honey in your next grilled cheese for a sweet surprise. Gouda: Has a rich buttery, slightly sweet flavor and a smooth, creamy texture that’s irresistible when melted. Savory flavors complement Gouda - try it with prosciutto or tomato. Muenster: Has a mild flavor and smooth, soft texture that stands out alone or is the perfect complement when melted alongside other cheese varieties. Match Muenster with sliced avocado for a sandwich that’s a smashing success. Fontina: A semi-soft cheese with a slightly sharp edge that is the perfect upgrade to any melty dish. Add fresh basil or pesto to a Fontina grilled cheese for a refreshing twist. Get choosy with cheese: Not all cheese is created equally. Try Arla cheese - a better-for-you cheese from a farm-to-fridge company. The naturally delicious cheese is made without any artificial flavors or preservatives and follows traditional recipes that have been handed down from generations. Veg out: Fresh fruits and vegetables can be the perfect addition for a nutrition and flavor boost to grown-up grilled cheese recipes. Add in avocado, amp it up with apple slices or get a little crazy with cucumber. The sky is the limit. A bonus tip is to stack your veggies inside the slices of cheese to lock in every bit of gooey, delicious flavor. Pack in the protein: The average person should get approximately 30 grams of protein at each meal, according to the Journal of Nutrition. You can get a jumpstart with Arla cheese, which has between 4 and 6 grams of protein in each slice. Visit www.ArlaUSA.com/GrilledCheese to learn more. Opt for whole grain: Say goodbye to the pasty sliced white bread of your youth and instead select a lovely whole grain bread from a local bakery for a tasty sandwich with a more wholesome crunch. Banish butter: Traditionally grilled cheese is made with butter or margarine, but you can still grill a mean sandwich when you select a lighter option. For example, swap in coconut oil or olive oil, which feature nutrient-packed fats and omegas, so you feel good as you munch on grilled goodness. Skip the spread: Put down that butter knife entirely and instead add oils directly to the skillet rather than spreading it on bread. Warm up the pan, melt your oil and then get ready to grill to a golden brown. Grill both sides: The perfect pairing to that awesome Havarti or Gouda is lightly toasted bread. To get a decadent crunch, try grilling both sides of the bread. Start by placing the plain bread slices on the skillet in oil to toast, then flip and add the cheese. Both sides get grilled and the cheese melts quicker. Cook low and slow: Have patience! You’ll get better results when you use medium-low heat rather than rushing. If you use too high of a temperature, you’ll burn the bread without thoroughly melting the cheese.